Woke up today before the alarm went off. Had coffee closed everything up so they could start work. We had to be out by 8 AM. We went over to "The Front Porch" restaurant for breakfast, we waited a while for Sue and Tony, then went in line for food. They came in and sat down we never saw them. Some how I saw Tony and we found them. Ate our breakfast and talked and talked. She is a nurse and lactation consultant. We hung out all day, they were so fun to be with. They have a motor home they really like it, just not comfortable for them on the living room sofa. They were looking at some new ones. We had lunch at the same place together, always sat at the same table. really enjoyed there company. They finished the motor and fan and took our FW out of the bay and we waited for the estimate for my drawer. They were having work done to there Motorhome too. This place is always hopping. I was sitting by myself at one point. This lady came over to me and started talking to me and asked if we were here for service. I told her we were, she said she had the free meal tickets for tomorrows breakfast and lunch. I said we could use them, we were with our friends she gave me 4 breakfast and 4 lunch ones. I gave her a hug and thanked her. 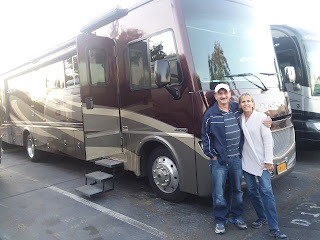 They went on a cruise while there RV was getting work done and it was finished ,so they didn't need them. RV people are so wonderful. So when Jim came back it was fun to tell him look what I just scored. Everyday some times more then once ,we go into the parts/accessories store. we were looking for something I forget what, and a class was started on holding tank maintenance. I thought what the heck, there is always something else to learn. Jim rolled his eyes at me, but that never stopped me before. It started at 2:30 was over at 5ish. Was so good the guy knew his stuff. Learned a lot. Jim only joined me at the end, who knows what the heck he was doing. The sewage system in a house and the black and gray tanks in an RV are totally different. He taught us how to keep everything clean and following smoothly. Then we ran to Publix and got some water while they looked at new MH. There MH was 3 spots down in the bay from us. They put them out front where ours was last time, 3 weeks ago and they put us back in the cabinet shop bay 77 now. So we were both staying another night, Yea. The FW was out in the sun all day close to 7 hours before they put it back in. Jim even plugged it in himself. They came and saw our camper we went and saw theirs. So we made dinner plans things kept changing as our day went. We were having so much fun and in between making sure the camper was progressing. We decided to go to Ruby Tuesdays. By the time we got to eat was after 8. OMG. Jim drove and they came along with us in our truck, it made it so much more fun. We got home after 10:30 the security guard checked on us, and we called it a night.